What is likely to be the cause of the ulcer in this horse – seen in the middle of summer and causing some considerable discomfort? What would you do? A swab yielded a profuse growth of Aspergillus. We performed a keratectomy and a conjunctival advancement graft to allow serum to be directed at the cornea, while also giving topical itraconazole. Unfortunately the horse went downhill rather suddenly with what turned out to be a corneal perforation as can be seen in this gross specimen of the enucleated eye. 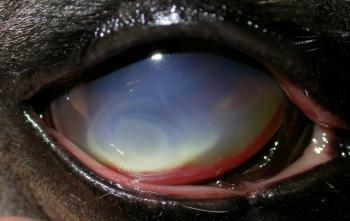 Dennis Brookes in Florida has perfected full thickness corneal grafting in such cases (Equine ulcerative keratomycosis: visual outcome and ocular survival in 39 cases (1987-1996). Equine Veterinary Journal 30:109-16) but here in the UK we don’t as yet see enough to be good at such proactive intervention! A bit of global warming will increase our experience I’ve no doubt! This entry was posted in Cases and tagged Horse. Bookmark the permalink.